Francisco Hernandez claimed a $250,000 Illinois Lottery prize in the nick of time–less than two weeks before the prize would have expired! “My wife heard that a winning Lucky Day Lotto ticket sold at our neighborhood store was going to expire July 12. Since I buy my tickets at that store, and often forget where I put them, we searched our entire house! I finally found the winning ticket in the glove compartment of my car!” The lucky Chicago resident’s ticket matched all five numbers – 09 – 23 – 33 – 37 – 39 – to win a $250,000 jackpot prize in the July 12, 2014, evening drawing. Hernandez is originally from Mexico and has lived in Chicago for over 25 years. He works as a chauffeur for the City of Chicago. 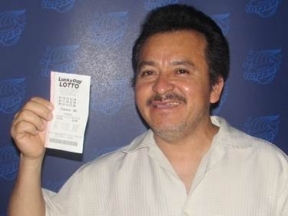 When asked about his plans for the windfall, Hernandez said, “I only want one thing – a house for my family.” he winning ticket was purchased at Liquorama, 4430 South Kedzie Avenue in Chicago. For more information, or to download the Lottery app, visit illinoislottery.com.